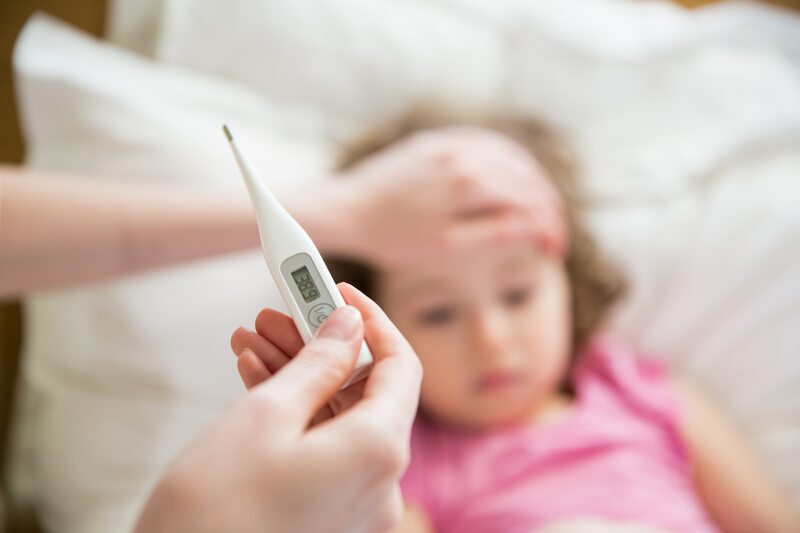 What is influenza and what are the signs of flu in children? Influenza is a virus typically associated with high fever, body aches, malaise, cough, sore throat, and upper respiratory symptoms. Although many people consider GI symptoms like nausea, vomiting, and diarrhea part of a “flu”, these issues are less commonly associated with influenza in older children, teens and adults. Typically 3 – 10 days. Is there only one kind of flu? No. There are multiple strands of flu, each categorized under a main sub-group: A, B, or C. Each year we see different types. Scientists use data from the southern hemisphere to predict what strains will most likely trend during our flu season. Can the flu cause serious side effects? Although a large majority of children recover from the flu within one week with rest and fluids, the flu can cause secondary complications. These may include ear infections, croup, bronchiolitis, febrile seizures, and pneumonia. Rarely, even serious neurological side effects or death can occur. Flu is spread from person to person via droplets, typically when a person talks, sneezes, coughs, shares food/beverages, kisses or lives in close quarters. Individuals have the ability to spread the virus 24 hours before they exhibit symptoms. Spreading is highest in the first 3 days of symptoms and usually drops around day 7 of illness. The incubation period for influenza is 1 – 4 days. Can I prevent the spread of flu? Yes! The best way to prevent the flu is by getting your flu shot. Flu shots are available for children 6 months of age and older. It is also important to encourage frequent and thorough hand washing, plenty of rest and avoiding contact with others when you are sick with cold symptoms and/or fever. What to do if your child has the flu? Some children may be eligible for anti-viral medication (Tamiflu). Tamiflu is usually suggested for very young children, those with complex medical issues, or if recommended by a medical professional. Tamiflu is most effective within 48 hours of symptom onset. Rest, fluids, a humidifier, and nasal saline may be helpful to manage upper respiratory symptoms. Children’s Tylenol and Ibuprofen can help reduce fever, headaches or body pain. If you think your child might have the flu, contact our office. We do have the ability to test for the flu. Does the flu shot prevent the flu? The flu shot is the first and best way to protect your children this season. Center City Pediatrics will once again offer walk-in flu clinics for registered patients at both locations. See our website for details, including frequently asked questions and a complete list of upcoming dates. Additional resources: Check out the CDC or the AAP websites for additional reading.